Matt Tuens, CEO, AcuVox, Inc.
Last session of the conference. Rhea takes the podium first. Vertical turned into Universal: videos, images, news results all can come up for a search result. <strike>SearchWiki</strike> Starred results: SearchWiki has become starred results. Users can bookmark results. SideWiki: She had a hard time finding anything with a SideWiki result. The only people using it were in social media or SEO. She doesn’t see anyone really using this, so it probably won’t become an issue. 40 percent of adults 30 and older use social sites in the fall of 2009. Use the Web site: this is often underestimated. Can you get your other properties or sub-domains to rank? Industry profiles to rank: Better Business Bureau, Indeed for job postings, etc. Up next is Tarla. Search rep management is keeping the first search engine results pages free and clear of negative results from branded search queries. Build positive assets to outrank negative listings. Caveat: engage with social profiles, don’t just set it and forget it for the sake of ranking. It takes months to for any of these options to rank, it’s not an overnight solution. Track your results. 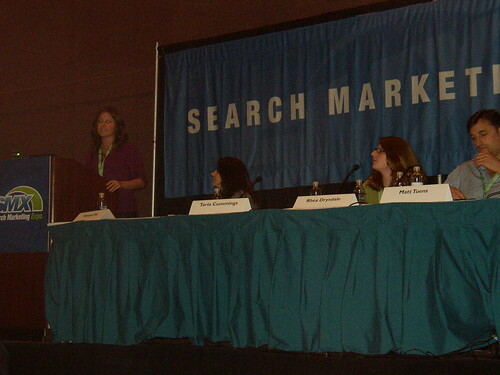 Regularly monitor all branded search queries for both positive and negative results. Matt is next. He’s going to talk about the proactive approach to rep management. If you leverage engagement with audience before something goes wrong, you’ll be in a good position for future success. 1. Make your site the authority of information in your industry. There’s no bad PR in SEO. When a client was being sued, the negative stuff they generated meant his client got lots of links coming in. Plus, Joe Consumer likes to read about this kind of drama. When you engage with community online, don’t be a jerk. The lawyer suing his client, has been cited for professional misconduct. It’s even in his Wikipedia page. When Barbara Streisand sued a photog for $50 million for taking a pic of her house, everyone found out and thought she was a jerk. 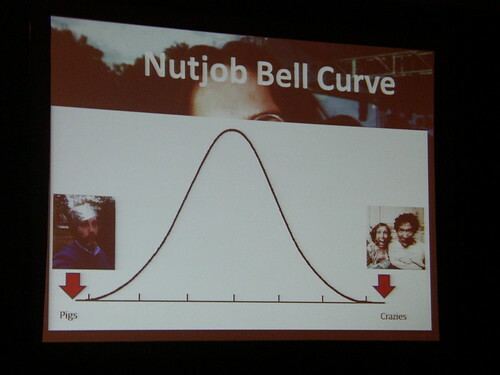 Don’t associate or interact with either side of the bell curve. That’s the exception to the engage, engage, engage motto. Don’t wrestle with pigs, like anti-[you] Facebook pages. Embrace your raving fans. They’re very vocal and positive for you. When dealing with threats, always respond, don’t go into detail, and be polite. Go public when you’re under threat. Reputation Management has become a huge part of business the past few years. We often have clients that ask us how they can “work” on their reputation. It would also be nice to see some information to use as a guideline to guide companies on what they can and cannot do legally.